CBI - China: Day 34 of 154 of the Japanese Invasion of Manchuria. Spain: Day 97 of 985 of the Spanish Civil War. CBI - China: Day 2 of 29 of the 1st Battle of Suiyuan. Spain: Day 462 of 985 of the Spanish Civil War. CBI - China: Day 107 of 2,987 of the 2nd Sino-Japanese War. Day 70 of 106 of the 2nd Battle of Shanghai. Day 51 of 70 of the Battle of Taiyuan. Spain: Day 827 of 985 of the Spanish Civil War. CBI - China: Day 472 of 2,987 of the 2nd Sino-Japanese War. Day 133 of 139 of the Battle of Wuhan. Day 10 of 81 of Japan's Operation GUANGDONG. Atlantic: The Luftwaffe starts attacks against North Atlantic convoys. British Hawker Hurricane fighters get their baptism of fire, shooting down five German Heinkel floatplanes searching for ships in the North Sea, while the Spitfires down another two. Poland: Germans start deporting Poles from Posen (Poznan) in their attempt at establishing "pure and Germanic provinces" in Poland. CBI - China: Day 837 of 2,987 of the 2nd Sino-Japanese War. ETO - UK: Day 46 of 258 of the Blitz. ETO - UK: Day 104 of 114 of the Battle of Britain. East Africa: Day 134 of 537 of Italy's East African campaign in the lands south of Egypt. CBI - China: Day 1,203 of 2,987 of the 2nd Sino-Japanese War. Day 342 of 381 of the Battle of South Guangxi. CBI - Thailand: Day 21 of 221 of the Franco-Thai War (Vichy France vs Thailand). Russian Front - Finland: Day 115 of 142 of Operation SILVER FOX, a joint German-Finnish campaign to capture the Russian port of Murmansk in the Arctic. Russian Front - Finland: Day 113 of 140 of Operation ARCTIC FOX, a joint German-Finnish campaign against Soviet Northern Front defenses at Salla, Finland. Russian Front - Finland: Day 122 of 164 of the Battle of Hanko. The Soviets will be forced off their leased naval base. Russian Front: Day 122 of 167 of Germany's Operation BARBAROSSA. Russian Front - North: Day 44 of 872 of the Siege of Leningrad. Russian Front - Center: Day 20 of 98 of the Battle of Moscow. Russian Front - South: Day 2 of 5 of the 1st Battle of Kharkov, Ukraine. German 6th Army captures Stalino, in the industrial Donets Basin. MTO - Libya: Day 195 of 256 of the Siege of Tobruk. East Africa: Day 499 of 537 of Italy's East African campaign in the lands south of Egypt. CBI - China: Day 1,568 of 2,987 of the 2nd Sino-Japanese War. ETO - France: US 8th Air Force B-17s and B-24s hit U-boat pens and airfields in France. Russian Front - North: Day 409 of 872 of the Siege of Leningrad. Russian Front - North: Day 170 of 658 of the Siege of the Kholm Pocket, USSR lays siege to the Kholm Pocket but the Germans hold out for a about a year and a half. Russian Front - South: Day 116 of 150 of Germany's CASE BLUE, the failed offensive to take the Caucasus oil fields. Russian Front - South: Day 60 of 165 of the Battle of Stalingrad, bloodiest battle in human history. MTO - Egypt: US and RAF warplanes attack landing grounds behind El Alamein front, near El Hamma and German tent areas found along the coast. East Africa: Day 170 of 186 of the Battle of Madagascar. CBI - China: Day 1,933 of 2,987 of the 2nd Sino-Japanese War. PTO - Alaska: Day 137 of 435 of the Battle of Kiska, Aleutian Islands. The US and Canada will defeat the Japanese invaders. PTO - Malaya: Day 245 of 357 of the Battle of Timor Island, a long guerrilla war ending in Japanese victory. PTO - New Guinea: Day 93 of 119 of the Battle of the Kokoda Track. The Australians continue pushing back the Japanese troops. PTO - Solomon Islands: Day 76 of 187 of the Battle of Guadalcanal. Russian Front - North: Day 774 of 872 of the Siege of Leningrad. Russian Front - North: Day 535 of 658 of the Siege of the Kholm Pocket. USSR lays siege to the Kholm Pocket but the Germans hold out for a about a year and a half. Russian Front - South: Day 59 of 122 of the Battle of the Lower Dnieper River, USSR. MTO - Italy: US 12th Air Force attacks at Benevento, Leghorn, Bastia, Cancello Arnone and Capua. CBI - China: Day 2,298 of 2,987 of the 2nd Sino-Japanese War. PTO - New Guinea: Day 33 of 219 of the Battle of Shaggy Ridge. PTO - New Guinea: Day 30 of 162 of the Battle of the Huon Peninsula. Will result in an Allied victory. ETO - France: Day 82 of 284 of the Battle of Brittany. ETO - Belgium: Day 50 of 62 of the liberation of Belgium. ETO - Belgium: Day 20 of 38 of the Battle of the Scheldt Estuary. Breskens, Netherlands, is captured by the Canadians, but fighting continues for 10 more days in the pocket. ETO - France: Day 37 of 236 of the Siege of Dunkirk. ETO - Germany: Day 33 of 145 of the Battle of Hürtgen Forest. ETO - Germany: Aachen finally falls to the US 1st Army, earning the distinction of being the first German city to be captured. Russian Front - Finland: Day 37 of 223 of the Lapland War. Finland and Russia have joined forces to kick the Germans out of Finland's most northern province. Russian Front - Finland: Day 15 of 23 of the Petsamo-Kirkenes Offensive. The Soviets will drive the Germans out of the Arctic region in northern Scandinavia. Soviet troops are advancing in Norway. Russian Front - North: Day 38 of 41 of the Battle of Riga, Latvia. Russian Front - Center: Day 7 of 206 of the Battle of the Courland Pocket in Latvia. Germans will hold this area until the very end of the war. Russian Front - Center: Day 17 of 18 of the Battle of Memel, a border town of Lithuania and East Prussia. The Germans continue to hold the Niemen line to cover East Prussia. Russian Front - Center: Day 38 of 72 of the Battle into East Prussia and northern Poland. Russian Front - Center: Day 6 of 15 of the Battle of Goldap, East Prussia. Russian Front - South: Day 16 of 24 of the Battle of Debrecen, Hungary. Russian Front - South: Day 38 of 72 of the Battle of Belgrade, Yugoslavia. MTO: US 15th Air Force: B-17s and B-24s attack targets in Hungary and Yugoslavia. CBI - Burma: Day 204 of 302 of the Chinese Salween Offensive in Burma. CBI - China: Day 2,664 of 2,987 of the 2nd Sino-Japanese War. Day 188 of 259 of Japan's Operation ICHI-GO. PTO - Hawaii: Use of US paper currency with the word "HAWAII" overprinted on both sides comes to an end. PTO - New Guinea: Day 183 of 481 of the Battle of Western New Guinea. PTO - Palau Islands: Day 37 of 74 of the Battle of Peleliu (Operation STALEMATE II). PTO - Palau Islands: Day 35 of 36 of the Battle of Angaur. PTO - Philippines: Day 2 of 299 of the 2nd Battle of the Philippines, aka the Liberation of the Philippines or the Philippines Campaign. PTO - Philippines: Day 2 of 73 of the Battle of Leyte. 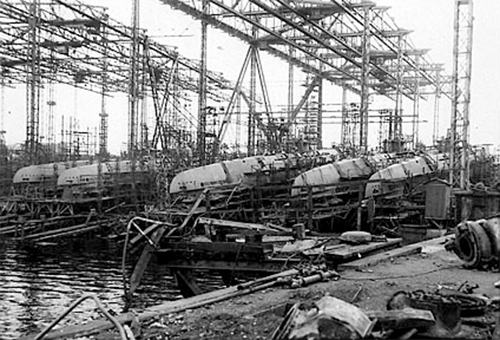 Germany: The U-boat pens in Hamburg are blown up by British Engineers using German explosives. The Kriegsmarine protected its U-boats in port in Germany and its occupied countries with massive bunkers designed to be virtually impervious to air attack. Hamburg was the site of two structures, "Elbe II" and "Fink II." The Finkenwerder bunker was constructed by 1,700 slave laborers over four years. After capture, it was demolished with 32 tons of captured German explosives, which seemed rather fitting to the victorious Allies. The end of hostilities in Europe had marked the end of Germany's hold on some of Europe's most important naval bases. The pens and bases utilized by the once powerful U-boat fleet were either demolished or used for a transitional period. Some are still in operation today.